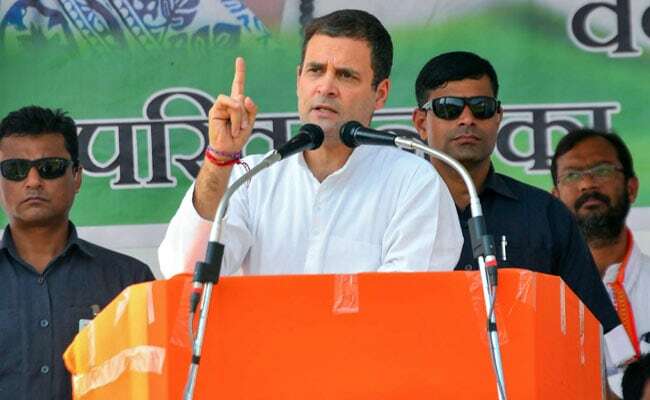 Rahul Gandhi accused PM Modi and Telangana Chief Minister K Chandrasekhar Rao of diluting the Tribal Rights Act, while speaking in Bhoopalpally, a tribal belt in Telangana. Congress president Rahul Gandhi said on Thursday said that Narendra Modi broke every single promise he made, including that of being an "honest" prime minister. Rahul Gandhi accused him and Telangana Chief Minister K Chandrasekhar Rao of "diluting the Tribal Rights Act to the detriment of forest dwellers. Addressing a students' convention and three election rallies in poll-bound Telangana, Mr Gandhi attacked PM Modi and Mr Rao over a variety of issues, including crony capitalism, while calling the state's ruling TRS and its "friendly party" AIMIM, the 'B and C' teams of the BJP. Mr Gandhi said PM Modi and Mr Rao made "many, many promises" but did not deliver on them. "The prime minister made promises of depositing Rs 15 lakh in the bank account of every citizen, two crore jobs to youth every year, farm loan waiver and a just minimum support price for farm produce. He also promised he will be the 'chowkidaar' of this country and not the prime minister," he said. "If the Prime Minister of India can write off (rupees) three lakh fifty thousand crore of 15 people...the richest people in the country, then he should be ready to waive the loan of India's farmers," he said. "I am not in the habit of lying to our people. I am not in the habit of making false promises. I made a commitment to farmers about agricultural loan waiver in Karnataka and Punjab, and when we were voted to power there, we wrote them off," he said. Addressing an election meeting at Bhoopalpally in the tribal belt of Telangana, he promised reservations in government jobs and admissions to state-run educational institutions for Scheduled Tribe candidates proportionate to their population in the state.